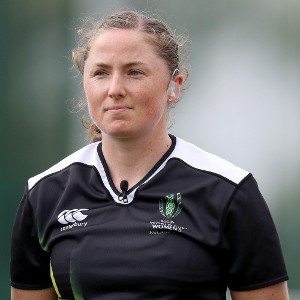 Cape Town - Aimee Barrett-Theron has become the first woman to earn selection to SA Rugby’s Premier Panel of referees after she was promoted to the top tier of match officials, along with Cwengile “JD” Jadezweni, Stuart Berry and AJ Jacobs. It means Barrett-Theron (30), who recently refereed the opening match of the Women’s Rugby World Cup in Ireland and the SA Rugby Under-20 Championship final in Welkom, will be in contention to referee matches in senior men’s competitions next year. In addition to these promotions, SA Rugby also announced that Jaco van Heerden has hung up his whistle to focus on his career as an advocate. Two other experienced match officials have also decided to retire from refereeing, but both Lourens van der Merwe and Pro Legoete will continue their careers as TMOs. Banks Yantolo, SA Rugby’s Referee Manager, said the four referees promoted to the Premier Panel had earned their stripes and have what it takes to succeed at the top. “Aimee, ‘JD’ and AJ have all delivered on the promise they’ve shown over the last couple of years, while Stuart has been around for a while and has performed at a consistently high level in recent times,” said Yantolo. “All the referees on our Premier Panel have Test experience and they are wonderful ambassadors to South African rugby wherever in the world they go. “They are rightly the cream of the crop here. “I am also excited about the quality of match officials on our lower panels – many of these referees have the potential to make it all the way to the top. Premier Panel: Quinton Immelman, Jaco Peyper, Rasta Rasivhenge, Egon Seconds, Marius van der Westhuizen, Stuart Berry, AJ Jacobs, Cwengile Jadezweni, Aimee Barrett-Theron. National A Panel: Ben Crouse, Stephan Geldenhuys, Ruhan Meiring, Paul Mente, Vusi Msibi, Jaco Pretorius, Archie Sehlako. National B Panel: Jaco Kotze, Pieter Maritz, Mpho Matsaung, Sindile Ngcese, Christopher Allison, Johre Botha, Griffin Colby, Jabian Jeftha, Phumzile Mbewu, Naka Bulelani, Eduan Nel, Divan Uys, Rodney Boneparte, Ricus van der Hoven. Women’s Panel: Siyanda Ketse, Maria Mabote, Le-Ann MacClune, Lusanda Mtiya, Ashleigh Murray, Bulela Qwane, Cameron Dyers. Sevens Panel: Christopher Allison, Aimee Barrett-Theron, Johre Botha, Griffin Colby, Ben Crouse, Morne Ferreira, Rasta Rasivhenge. TMO Panel: Christie du Preez, Johan Greeff, Marius Jonker, Joey Klaaste-Salmans, Shaun Veldsman, Willie Vos, JJ Wagner, Lourens van der Merwe, Pro Legoete. Selectors: Banks Yantolo, Eugene Daniels, Dennis Immelman, Mark Lawrence, Balie Swart, Deon van Blommestein. National Performance Reviewers: Jacques Hugo, Dennis Immelman, Thuso Mngqibisa, Willie Roos, Johann Alberts, Willie Hess, Dawie Oberholzer, Arthur Southgate.